As we pull up to this bandshell right off the beach in Miami... I was questioning whether we were in the right place. It was SO small! We parked in a metered beach access parking lot and as we were looking for a space we were seeing people tailgating,this was a sure sign... we are in the right place! My people were everywhere! Up to Will Call, no line... and once inside it was clear this was going to be a special event. It was SO tiny! Not an obstructed seat in this adorable outdoor venue. There were bench seats in the middle and around the perimeter... but a dance floor in front of the stage. I wormed my way up front and got my camera ready for some sweet shots. The band came out just after 8pm, the sun was just setting...and they started with a wild progressive jam! It was wonderful to see them in this setting... so intimate! I love being up close to the bands I see... makes it so much more real when you can hear their playing directly from them and their instruments, and not through amplifiers or monitors or blown out speakers. They played an amazing first set... getting in their groove. 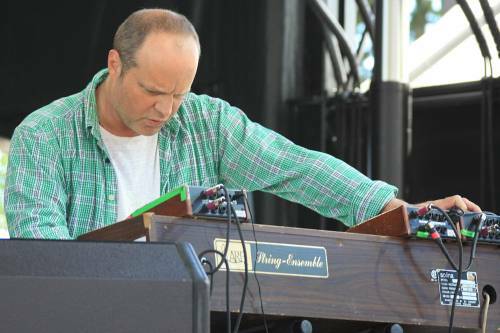 John Medeski being from Ft Lauderdale, Florida since the age of five, I am sure he felt that "home" vibe. Tan and smiling, and doing his usual alien babbling all to himself, eyes closed and all mad scientist-like, centered amidst his box of instruments, arms flying and head bopping... looking at Billy and Chris for queues... the music heightened and mellowed. They broke for about 20 minutes and then resumed the assault. The second set, as always, was even better. Throwing out some old favorites from Bubblehouse and Shackman... they threw in some latin grooves that got the distinctly thick latino crowd moving and salsa dancing the night away. The stars were shining, the balmy sea breeze blowing... and the music was just phenomenal. 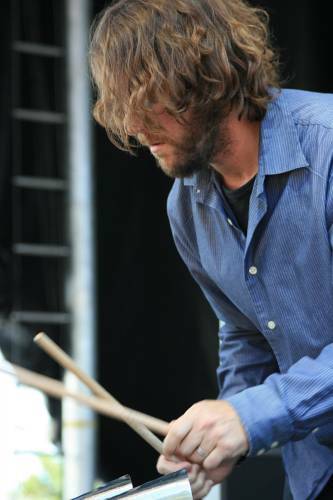 Billy Martin at one point doing his trademark leaping from behind the drum kit to the floor of the stage and banging on everything from cowbells to wood boxes to metal scraps and various things he's collected from his many travels. Chris Wood started the show in the first set with his electric bass and the in the second set moved to his wonderfully deep resounding 1920 German Acoustic which resonates like no other. These three definitely have an awe inspiring presence and energy that permeates the air around them and the stage. Almost another language as they communicate with each other by sound and visual queues... in a spiritual almost other-worldy vibe. I guess if you have been together as long as they have through the ups and downs of one of the hardest professions on the planet, since 1991 and still going strong... you would create a language all your own as well. I feel fortunate to have seen them in this small venue together. I have seen them at festivals a bunch and individually in smaller places. I actually just saw Medeski with Skerik, Johnny Vidacovich and Mike Dillon at the Maple Leaf in New Orleans this last Jazz Fest... but seeing the trio in it's rightful state and as intimately as this, on the beach... is pure treasure... as it should be.